Produktinformationen "Korean 2 - Textbook"
We offer this widely used textbook series at a big discount, check out the Audio-CD as well - only while stocks last! Wir bieten dieses große Koreanisch Lehrwerk zum Angebotspreis, sehen Sie auch die CDs - nur solange Vorrat reicht. 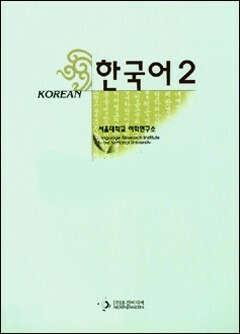 Korean 2 is the second Volume of the Korean Language textbook series by the Language Research Institutue of Seoul National University, written for adult learners who have a knowledge of Korean with about 200 hours of classroom time or the equivalent. The text aims to develop necessary communicative skills in everyday social situations. It consists of 30 lessons, and each lesson has main paragraph, pronunciation, grammar, and vocabularies & expressions. Weiterführende Links zu "Korean 2 - Textbook"
Unser Kommentar zu "Korean 2 - Textbook"
Kundenbewertungen für "Korean 2 - Textbook"